ASTANA – The honorary award Patron of the Year was awarded to philanthropists Sergey Blok, Alibek Semgaliyev and Bekbolat Achibekov at the Dec. 12 national award ceremony Narodnyi Lubimets (People’s Choice) at the Rixos President Astana Hotel. Born in 1969 in the Kostanai region, Blok completed his education at the Kostanai Institute of Physical Education, the Kostanai Pedagogical Institute and Kostanai State University. He began his entrepreneurial activity in 1992, establishing a dairy product manufacturing business in 1997. He now directs the dairy plants MILKH and PK Vita, which were recently expanded to include ice cream production. 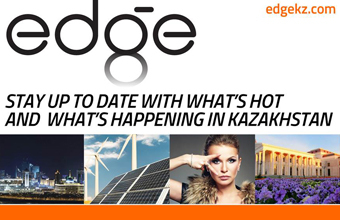 He is one of Kazakhstan’s 100 New Faces. Also one of the 100 New Faces, Semgaliyev works in oil and gas and provides financial assistance to novice athletes, orphans, the elderly and children with disabilities. Achibekov carries out his entrepreneurial and philanthropic activity in Aktau. Last year, philanthropists Makhmud Nalibayev and Sagadat Nurmagambetov won Patron of the Year. Additional national award winners in 26 other categories, main and honorary, were named at the ceremony. More than 500,000 Kazakhs voted online to determine winners in this year’s main nomination categories, with more than 300,000 voting online last year. In addition to Patron of the Year, honorary award nominations feature Breakthrough of the Year, Golden Age, Success and Development, Social Enterprise of the Year, For Contribution to the Development of Astana, Agroprom Leader and Braveheart. This year’s new honorary award categories are Soldier of the Year, Police Person of the Year and New Trade Union Faces. Honorary award winners include Samal Yeslyamova, Toregeldy Sharmanov, Nadezhda Shabayeva, Farit Galimov, Murat Sarsenbayev, Azamat Baltabayev, Galymzhan Aleukhanov, Arman Shaizatov, Dinara Aitzhanova, Rauan Bralin and Tatyana Bulgatsevich. The event honours public figures in politics, sports, fashion, traditional and social media and the private and public sector. It was held for the eighth time, hosted by Meirzhan Alibekov and Dinara Satzhan and organised by Galym Baituk, president of the public foundation Nation – Region – Development. At the ceremony’s end, a charity auction was held among the attendees.